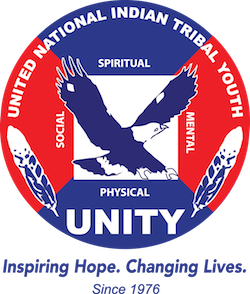 UNITY Alumni Honored for Community Advocacy – UNITY, Inc.
Layha Spoonhunter received the “Eddie Wadda Alumni of the Year Award” at the 2018 National UNITY Conference in San Diego, California at the 42nd Annual UNITY Gala banquet, Sunday, July 8, for his dedication and leadership reaching his community and American Indian youth through service and advocacy. His nominator, (Claullen Tillman) wrote; “I simply cannot say enough about Layha and what he has meant to our tribal youth and our tribe of the Eastern Shoshone. As long as I can remember Layha was at Eddie Wadda’s side with only one thing on his mind, making the reservation a better place for all of our tribe’s youth.” Spoonhunter is from Fort Washakie, Wyoming and represents the Eastern Shoshone, Northern Arapaho and Oglala Lakota Tribes. Recently, Spoonhunter served as a conference volunteer and facilitated workshops. “Mi Vida Su Vida” was the title of one workshop, meaning; “My Life, Your Life”. He teamed up with co-facilitators; Thomas Lopez, Micaela Iron Shell and Eryn Wise, to guide the youth through a variety of related topics; to include gender identity, sexual orientation, me too movement, healthy relationships and the advocate roles at Standing Rock. Spoonhunter independently facilitated a second workshop called, “Strength in Advocacy” which covered activist movements, youth roles of advocacy with an emphasis on gender norms, cultural identity, two spirit advocacy and using social media to reduce bigotry and homophobia. Spoonhunter has offered many workshops at conferences and events. In the past, Spoonhunter, served on the 2012-2013 National UNITY Council Executive Committee and was member of the first class of the 25 Under 25 Native Youth recognition program inducted at the National Conference in Portland, Oregon in 2014. He earned an associate degree in Arapaho studies at Wind river Tribal College. He was fortunate to meet President Barack Obama two times. Once while attending the 2015 White House Tribal Nations Conference and the other by special invitation to the 2016 White House LGBT Pride reception, both held in Washington DC. Spoonhunter, also served the International Tribal Youth Council; throughout the movement at Standing Rock. Congratulations Layha from your UNITY Family!